Here’s the first chapter of my new novel, which is probably a couple of months away from actually appearing in print and ebook format. It’s a sequel to The Portal. It would help to read The Portal first, but I think I’ve filled in the backstory sufficiently that this isn’t strictly necessary. I was standing in the snack-food aisle of the 7-11 when I saw her. Somehow I knew who she was—or what she was, really. Even though she looked like everyone else, was dressed like everyone else. There was something about her eyes, her gaze. Something I remembered…. But just then my friend Vinny Polkinghorne came up behind me and whacked my Red Sox cap off, and when I had picked it up the woman was gone. “Cut it out, Vinny!” I said, but he just grinned. I ran to the front of the store, but she wasn’t there, and I couldn’t leave the store without paying for my bag of Doritos, and when I had done that and gone outside, she wasn’t there either. She wasn’t anywhere. I handed him the bag. “Let’s go hang out at the harbor,” he suggested, opening the bag and stuffing his mouth full of Doritos. Vinny handed the bag back to me, then got on his bike and rode off. I got on mine and searched for the woman for a couple of minutes, but I didn’t spot her. So I got off my bike and sat on a bench across from the Glanbury post office. After a minute I took out my cell phone and called Kevin Albright. I was still getting used to having a cell phone. My parents had finally relented and got us all phones, even my kid brother Matthew, because everyone else in the world but us had one. Also, I think they liked it that we were all getting along so much better, which was mainly due to me and the way I had matured. My parents had no idea why I had matured, of course, and I wasn’t going to tell them. “What’s up, Larry?” Kevin said. “I’m pretty sure I just saw someone,” I replied. The portal. Our secret. The invisible device that took you to other universes—like the one we lived in but different, in little ways and big ones. The device had taken Kevin and me to a universe where we’d ended up trapped for months, without cars or computers or phones, where we’d fought in a war and Kevin had come down with a strange disease and almost died. And where I found another version of my family, different from mine but somehow the same. A universe in which I had already died. “I don’t think it’s over,” I replied. “You don’t want it to be over,” Kevin said. I put my phone away. I was right; I knew that. But I was thinking about what Kevin said. You don’t want it to be over. Was that true? Maybe. I didn’t run away from that woman when I saw her; I went looking for her. That said something, didn’t it? And I knew that Kevin may have sounded bored, but he wasn’t, not really. He wanted to know what was going, too. But maybe I wanted it a little bit more. I rode my bike home. My kid brother Matthew was playing a video game in our room. Mom was in her office, working on one of those grant proposals she gets paid to write. My older sister Cassie wasn’t home; she was in the play at the high school and stayed late every day rehearsing. I sat in the living room and tried to concentrate on my homework. It wasn’t any use, though. What did she want? She knew my name. We’ve got to talk. I thought about the preacher. He had called himself simply a traveler. He was from one of those other universes. They used the portal to travel around to universes like ours and give sermons to people who mostly paid no attention to them. Seemed like a waste of time to me, but I guess he knew what he was doing. He had helped Kevin and me get home, which he didn’t have to do, and for that I was grateful. I wondered what universe he was visiting right now. Dinner was the usual—Dad got home around six, and he wanted to know about everyone’s day while we ate spaghetti and meatballs. Of course Cassie didn’t like the meatballs, but she was more interested in telling us about her rehearsal than complaining about the food. She went on and on about who was messing up their lines and who didn’t understand their character and whatnot. She didn’t have a very big part, but she was convinced that she should have the lead. I overheard Dad tell Mom once that drama gave Cassie “an outlet for her histrionics.” After I looked up the word, I decided he was probably right. Matthew had a long, boring story to tell about his Social Studies project, which he was doing with his friend Zach and involved creating a display of agricultural products from different states. Or something. What could I say? Things were kind of boring. Except for the thing that I couldn’t talk about. After supper I went upstairs and surfed the net for a while. Matthew asked me what I was doing, like he always does. “Shut up, Larry,” he said. But I knew he wasn’t upset. The next day at school Kevin cornered me in the lunchroom. “It’s not here,” he repeated. “Don’t be stupid,” he replied. I had been by myself when I first discovered the portal, and I didn’t know what it was—just some invisible something that let me hide from the annoying Stinky Glover. I used it fast—found myself in another universe, spent half an hour exploring a Glanbury that was kind of like the town where I really lived and kind of not, and then I came back. It had been Kevin’s big idea to go into the portal again, this time with him. And we landed in a very different, very scary place. And it was Kevin who came to regret that decision even more than I did. I wanted to argue with him. What did odds have to do with it? The woman was looking for me. Which meant she knew where she could find me. Which probably meant she knew the preacher. But why was she looking for me? We hurried up and ate, and we talked about other stuff. But Kevin still looked worried. After school I went home on the bus. I didn’t really feel like hanging out downtown like I usually did. I didn’t have much homework, so I went back to trying to understand the Wikipedia article on the multiverse. Like Matthew, my father had noticed me reading about the multiverse once, and he’d gotten really excited, and he tried to explain to me about Everett’s many-worlds interpretation of quantum mechanics and the wave function collapse and other stuff I wasn’t ever going to understand. I pretended to be interested—and I guess I was, sort of. I knew that what happened to me and Kevin was real, but it was nice to know that there was science behind it—that smart people like my Dad could possibly believe it was real. Anyway, I gave up on Wikipedia after a while and I decided to take a walk in the conservation land behind our house. This was where I had found the portal back last fall. Now it was spring, and the leaves were budding on the trees and the ground was a little muddy, so my mother would probably yell at me if I didn’t wipe off my sneakers before I went back in the house. She used to be really worried about me wandering off by ourselves in the woods, but she’s calmed down a bit lately. Apparently she has decided I’m not quite as stupid as she thought. I found the spot where I had stumbled onto the portal when I was trying to get away from Stinky Glover. I groped around to see if it was there. It wasn’t. That didn’t necessarily mean anything. It could be anywhere. The preacher had moved it, back in the other universe. And, like Kevin said, he—or someone—had taken it away from here sometime after we returned. What did I know about portals? I felt a surge of disappointment, though. And I knew that Kevin was right. I didn’t want it to be over. And that’s when I heard the voice. It was so soft that at first I thought I was imagining it. I couldn’t bring myself to answer. I turned. And she was there, standing among the trees, staring at me the way she had at the 7-11. 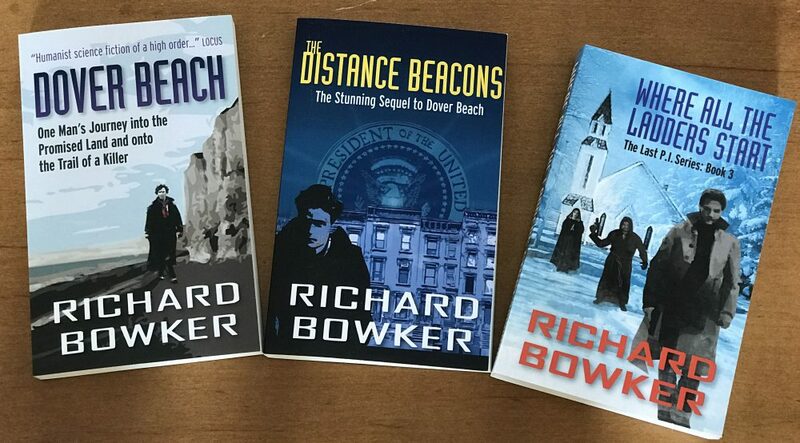 This entry was posted in Writing and tagged alternate universe, alternative history, authors, fiction, novels, parallel universe, science fiction, writing by Richard Bowker. Bookmark the permalink.